I knew it was going to stir the pot. 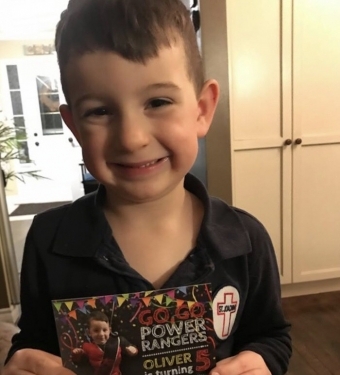 "No gifts please- Oliver would love a small donation towards his new Power Ranger bedroom." As a Boxing Day, Dec 26th baby, he gets inundated with gifts. In fact, our whole family gives and gets a lot as my husband's birthday is Dec 29th and mine is Dec 30th. It's a week of presents, celebrating, and sometimes gluttony. By the time January 2nd rolls around, I don't want to eat, drink, or open any more gifts. As the years pass, I couldn't help but think, is this necessary? "Toys to little boys who don't have toys." At the same time, I'm donating clothing and shoes I've outworn or don't wear at all. But at the same time, we're a maximum experience family. This past year we traveled to California twice, PEI, Alberta, a cottage in Muskoka, and we're now talking about going away the week of our birthdays. I've finally been able to convince my husband that taking all the money we'd normally spend on gifts, and taking a trip instead, is better. That's why I wasn't surprised when the comments came in about our son's birthday party. "It looks like you can't afford his bedroom"
But what they didn't know is Oliver's been talking about his bedroom all year. And when we suggested that his school friends and family could help him create it, his eyes widened with joy and he screamed "YES!" "Mom, Dad.. come out back! Look at the sunset." "Remember when we caught that frog (and let him go) at the cottage?" "Where are we going today? Let's go somewhere!" Especially while we're healthy, profitable in business, and have the ability to travel. But we weren't always like this. We were in the rat race, overweight and overwhelmed. If you're feeling chronically stressed, disconnected from each other, or like you're needing more. I suggest answering 3 questions. 1) "What were we doing as a family the last time time we shared big belly laughs?" Go do that, or a free, cheap and cheerful version of it. 2) What stresses us out the most and what do we dread? Say "no" to that. Yes, you can. You can get out of pretty much anything. 3) What do we need to generate to create the experiences we want? With way too much maple syrup, drink coffee and baileys, and watch Oliver open a few gifts that we know he REALLY wants. And not have to sit through 45 minutes of opening gifts. These are 5 year olds, they lose their attention easily! Run some Facebook ads, generate awareness, and serve clients bigger to generate the income to travel the way we want. And do things on your own terms. Give people your 110% presence, not simply a present. And if your love language is giving gifts, then take a loved one to a movie, out to dinner, a show or if you can afford it, a week/weekend away. Create a memory. I promise it will last a lifetime! Need help taking your offline business online. Book a free strategy session today!